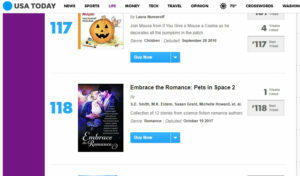 Embrace the Romance: Pets in Space 2 hit the USA Today Bestseller list at No. 118 out of 150! A big thank you to everyone who bought a copy and made it happen! This my second time hitting the USA Today Bestseller list. The first time was exciting because it was the first time. But this is a special thrill because it’s for science fiction romance, the genre I write. I want to thank authors Veronica Scott and Pauline Jones, who spearheaded this project and did massive amounts of work to keep us all on target. This was a team effort of all 12 authors: Laurie Green, Susan Grant, Susan Smith, Michelle Howard, Jessica Subject, Carol Van Natta, Sabine Priestly, Alexis Glynn Latner, M.K. Eidem. Also, we could not have done it without the assistance of Narelle Todd of Get My Book Out There. 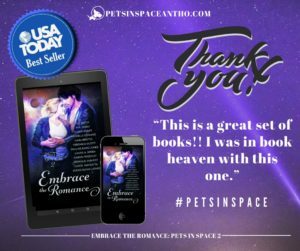 This entry was posted in Science fiction romance and tagged Cara Bristol, Embrace the Romance: Pets in Space 2, science fiction romance, USA Today Bestseller list. Bookmark the permalink.